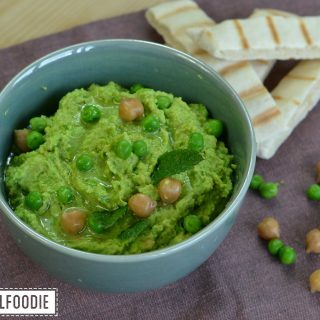 I always love discovering new food in my supermarket, especially when it’s either super healthy or very delicious (or both!). In this blog post I’m sharing my 7 favorite new discoveries from the last 3 months. From healthy granola to red velvet chocolate bars; all these products are now for sale and tried and tested by me. Some products are available worldwide, some in Europe and some (unfortunately) only in the Netherlands. I’ve listed the availability with each product. I’d love to hear which ones you’ve already tried or if there are new products that are missing in this blog post! 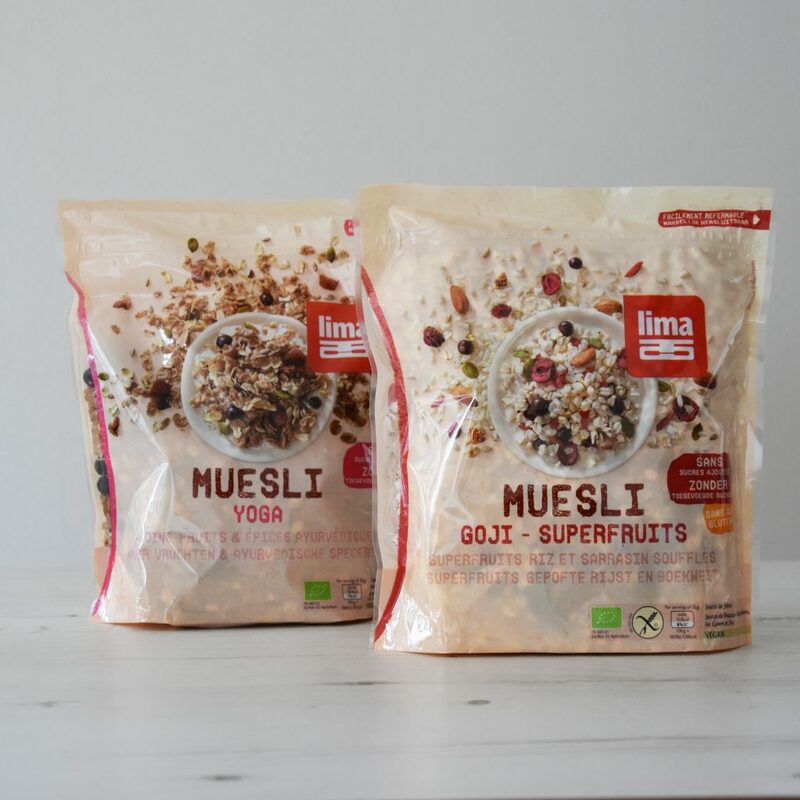 Lima introduced 4 new muesli’s that are all organic and vegan. They don’t contain any added sugars and are full of nutrients. The Muesli Yoga is high in fibers and the Muesli Protein is high in plantbased proteins. The Muesli Incas has quinoa and amaranth, foods that the Inca’s already considered as ‘wonder grains’. And the 4th flavor, Muesli Goji Superfruits, has goji berries and dried superfruits. Lima Bio Foods is a Belgium based company and the muesli’s are for sale in Belgium, The Netherlands, France, Germany and Spain. Perfect World is sugar free and vegan ice cream. It’s been for sale in England since 2014 and as of May 2018 it’s for sale at Jumbo supermarktets in the Netherlands as well. 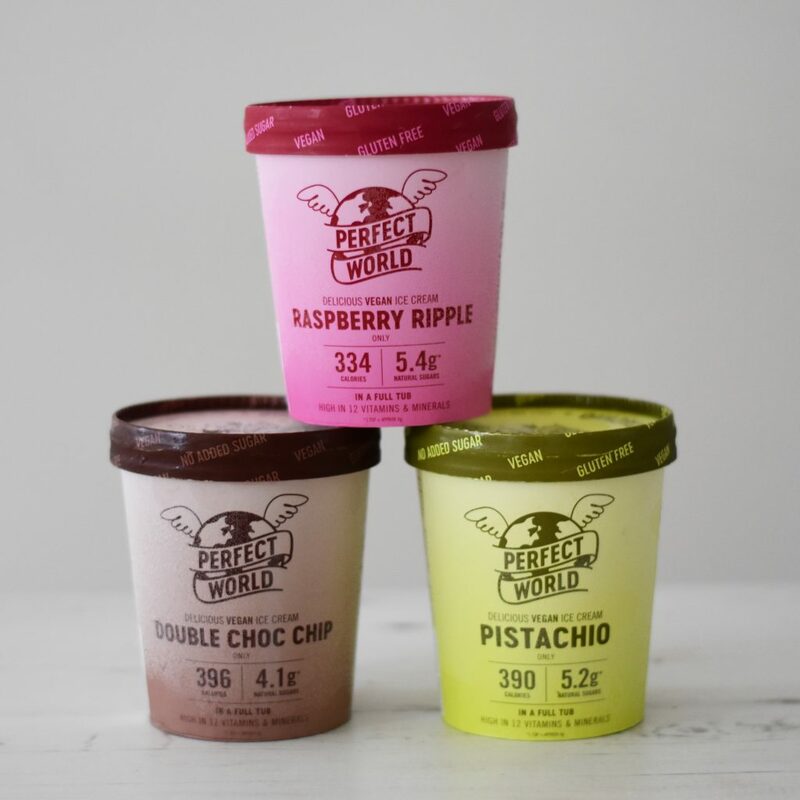 Perfect World is creamy ice cream as you’re used to, but than healthy and plant-based! Better for you and better for the planet. They have three flavors: Pistachio, Raspberry Ripple and Double choc chip. Two scoops of Raspberry Ripple only contain 67 calories! I love going to tropical islands, but did you know that the Netherlands also has islands? There are 5 inhabited islands in the North of the Netherlands and they’re called the ‘Waddeneilanden’. 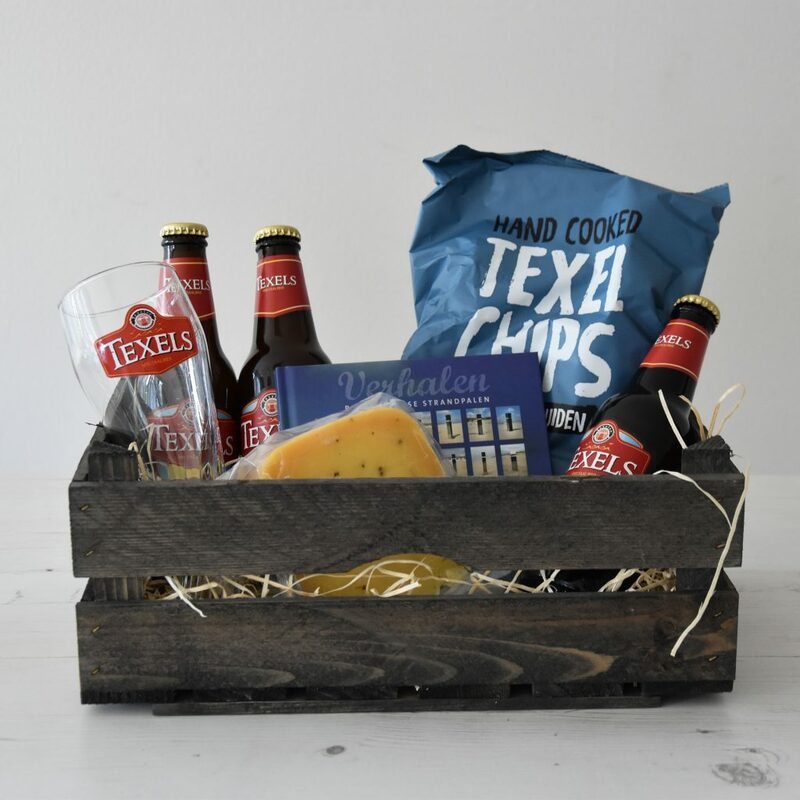 One of the islands is Texel and it has its own beer brewery. My boyfriend loves their ‘Skumkoppe’ beer. In May they released a special summer beer called ‘Seumerfeugel’ and it has a hint of citrus and samphire. It has a light color and a low alcohol percentage of 3,9%, perfect for warm summer days! I think it’s great that the EU is making steps to ban single use plastic, but sometimes disposables are just really handy. When you’re throwing a party or having a picnic for example. 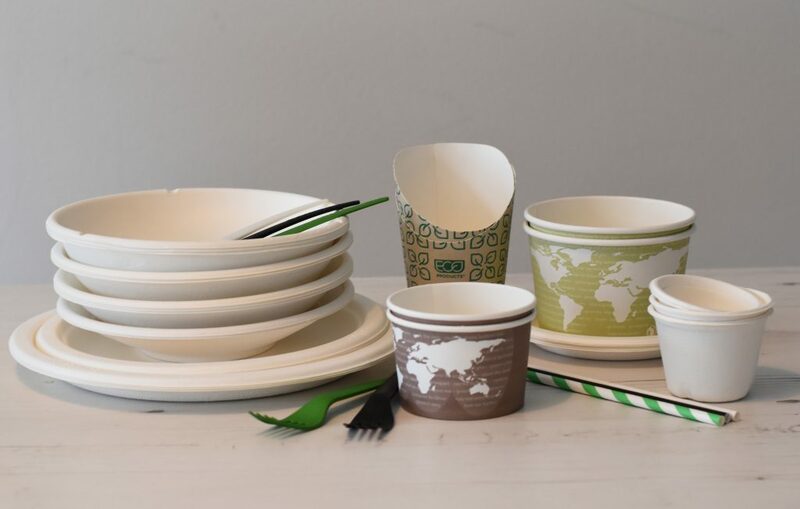 Luckily Eureka Caterware has a wonderful solution: compostable disposables. 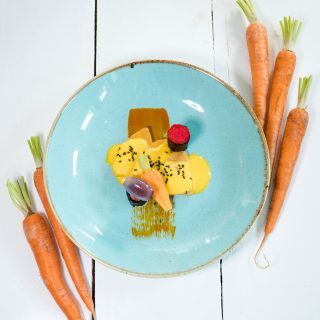 They have plates made of sugarcane, bowls made of bamboo and sushi trays made from plant-based plastic! I think it’s great that Eureka is innovating and taking its responsibility to take care of our planet. The new eco-line is 100% compostable, even the straws are eco-friendly! 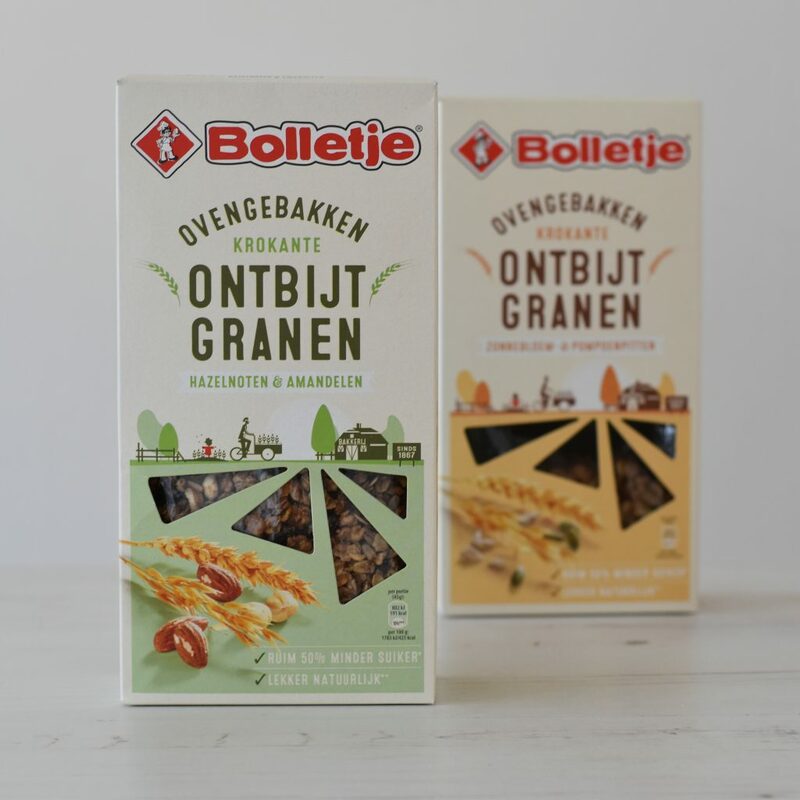 Dutch breakfast-brand Bolletje has introduced 3 new products. Bolletje is famous for its ‘beschuit’ and also sells Knäckebröd and crackers in Dutch supermarkets. As of this spring they added 3 crunchy mueslis to their assortment. These ‘Krokante Ontbijtgranen’ don’t contain any raffinated sugars (or honey), and are only sweetened with a bit of date. 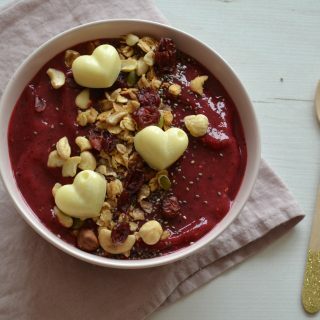 This makes them a a much healthier option than most supermarket granolas, because I absolutely understand that you don’t always have time to make your own homemade granola. 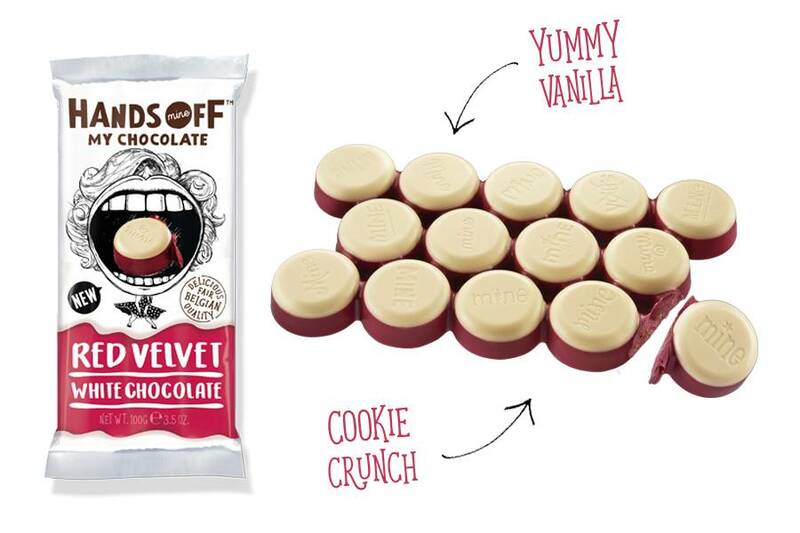 The chocolate brand with the best name in the world ‘Hands off my chocolate‘ has added a new chocolate bar to their family: Red Velvet and White chocolate. This chocolate bar is inspired by the classical Red Velvet Cake and is made with only natural ingredients and real Belgian fair-trade chocolate. The colors are great with a pink bottom and white top. The good thing about this bar is that you don’t have to share it, you can keep everything to yourself as each piece is marked with ‘mine’! 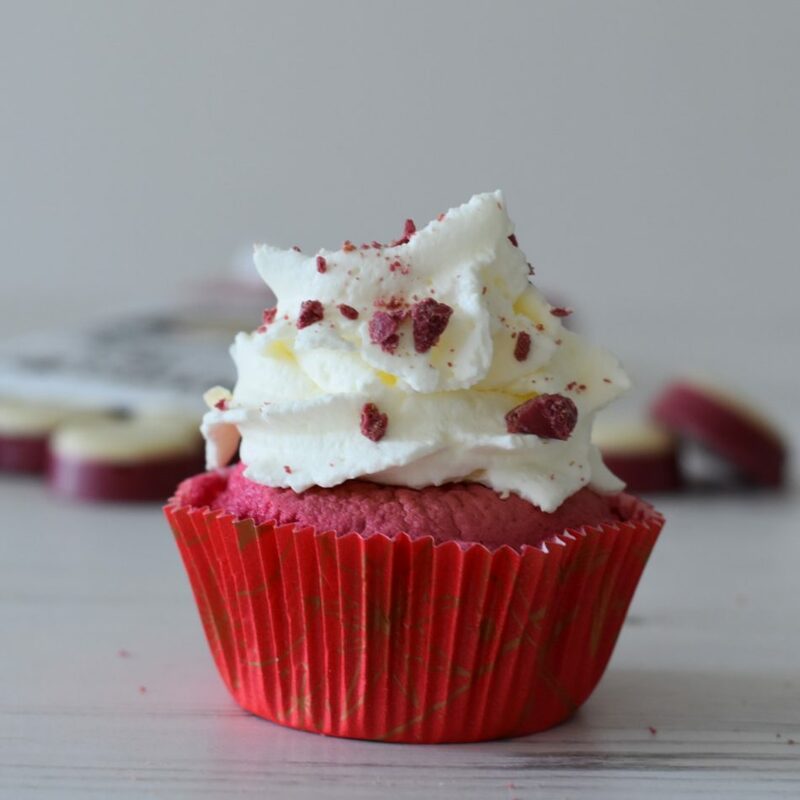 I’ve decorated the red velvet cupcake at the top of this page with red velvet chocolate bar crumbles. 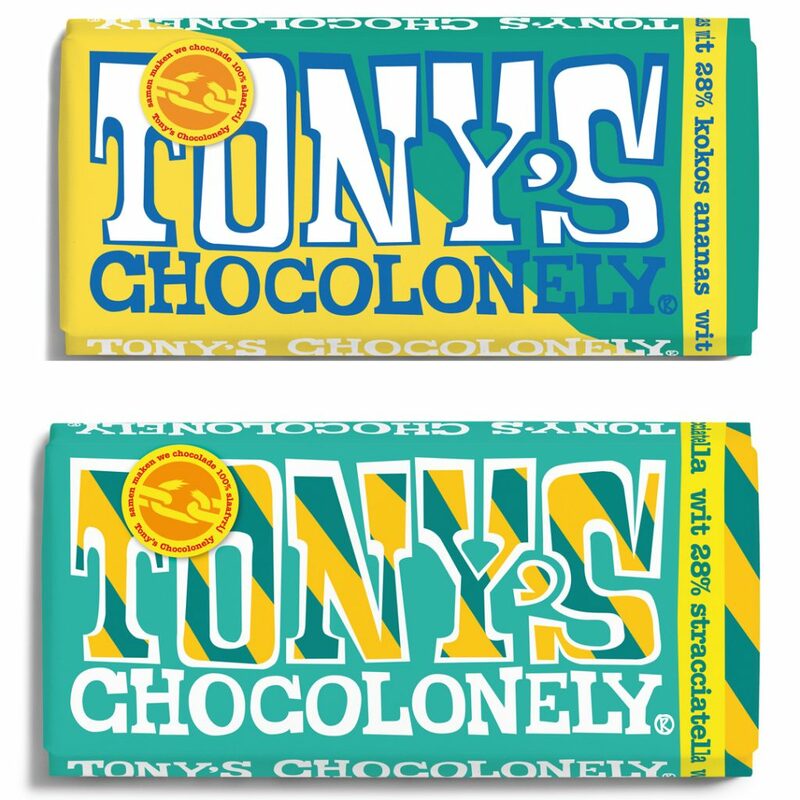 You can find the Hands Off my Chocolate in Dutch supermarkets Albert Heijn, Marqt and Jumbo and you can order it online if you live in the Netherlands. Lakrids is a very special liquorice brand from Johan Bulow from Denmark. They have very special flavors like chocolate coated liquorice with passionfruit or coffee and dark chocolate liquorice. Lakrids has released a limited edition for the summer of 2018. 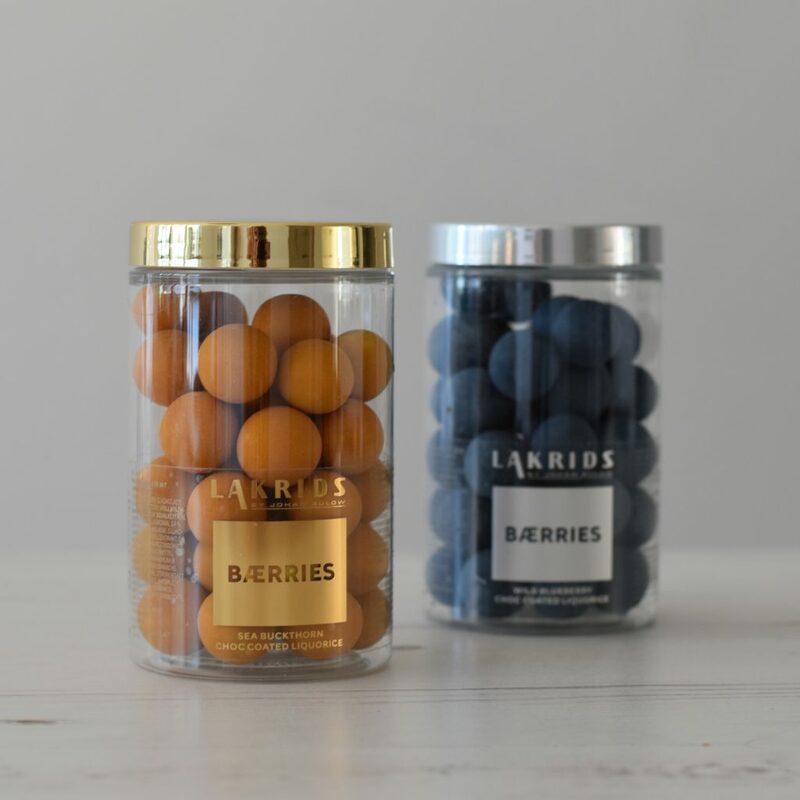 These ‘Bærries’ come in two flavors: Wild Blueberrie and Sea Buckthorn. These two berrie flavors in combination with the chocolate coating are ideal flavors for warm days. 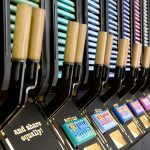 Lakrids ships worldwide, order your Lakrids Liquorice here. 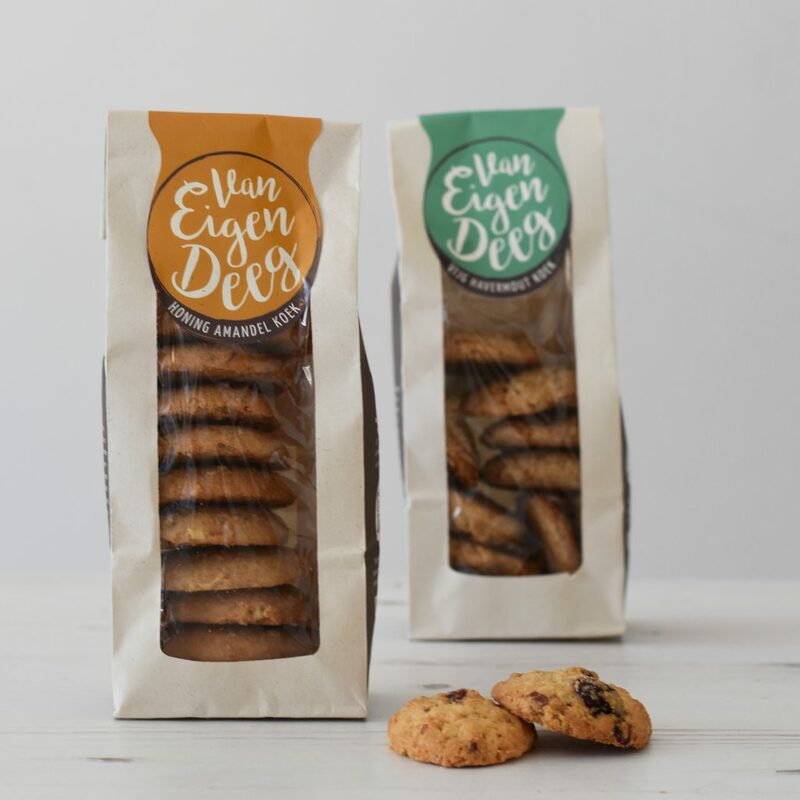 I discovered these new Van Eigen Deeg cookies in the Dutch Jumbo supermarkets. 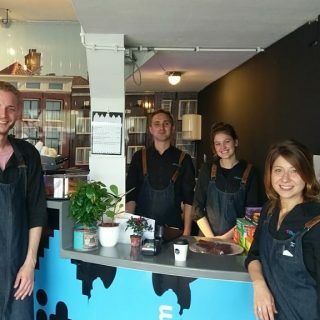 They’re made by a baker’s daughter from Nijmegen who wanted to let people enjoy in a responsible way. 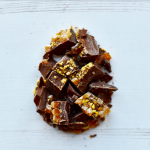 These artisan cookies are made with natural and fair ingredients. And what makes them really unique is that the package is a 100% decomposable! There are four different flavors, pictured are honey-almond and fig-walnut, and you also have chocolate-spelt and cranberry-coconut.